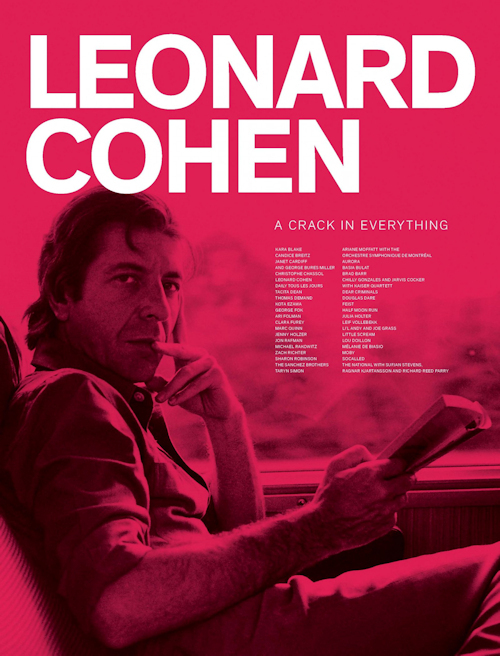 Book: "Leonard Cohen: A Crack in Everything"
Re: Book: "Leonard Cohen: A Crack in Everything"
The brochure of Montreal exhibition? I have received my copy of the book - a very handsome, hard bound book, 160 pages, all in colour. All artists of the MAC exhibition are featured with text and photos. A great memento for those who have seen the exhibition! The world-renowned novelist, poet and singer/songwriter inspired generations of writers, musicians and artists. For decades, Leonard Cohen tenaciously supplied the world with melancholy but urgent observations on the state of the human heart. With equal parts gravitas and grace, he teased out a startlingly inventive and singular language, depicting both an exalted spirituality and an earthly sexuality. His interweaving of the sacred and the profane, of mystery and accessibility, was such a compelling combination it became seared into memory. Situated between monograph and devotional exercise, this visually striking publication documents a unique exhibition and pays homage to a global star’s enormous cultural achievements. Visual artists, filmmakers, performers and musicians from around the world revisit Cohen’s words, songs, and biography with new perspectives. Cohen himself makes an appearance as a visual artist with a projection of his many self-portraits.Co-curators John Zeppetelli and Victor Shiffman discuss the two years that went into bringing the ambitious event to fruition, from its original conception as a celebration to its final form of a tribute suffused in elegy. Cohen biographer Sylvie Simmons reviews Cohen’s career from early promise to unexpected paths, through set-backs, and onto its astounding culmination. Chantal Ringuet draws upon specific moments in Cohen’s life from early childhood to his last writings where he seems to be reciting his own Kaddish, the Jewish prayer for the dead. Also featured are artist statements from each of the 40 participants. Visual artists: Kara Blake, Candice Breitz, Daily Tous Les Jours, Janet Cardiff and George Miller, Christophe Chassol, Tacita Dean, Thomas Demand, Kota Ezawa, George Fok, Ari Folman, Clara Furey, Jenny Holzer, Jon Rafman, Michael Rakowitz, Zach Richter, Sharon Robinson, Carlos and Jason Sanchez, Taryn Simon. Thank you, Jarkko. The book looks stunning!